1) Who doesn't break out in smiles at the sight of a wee lass twirling about in a pretty skirt? 2) More importantly, I have limited garment making experience/ knowledge and for some reason I'm always reluctant to use ready patterns and like to make my own. But one upshot of this not-so-conducive-to-fabulous-garment-making combination is that I have to think up projects that are uncomplicated but totally wearable. 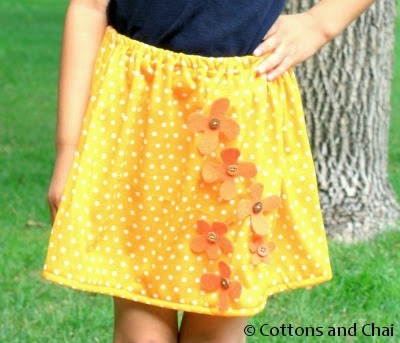 So here's my trick for today - I choose the simplest skirt to make and jazz it up with embellishments and detailing. In a nutshell, this particular skirt is nothing but a rectangle with elastic sewn on top, hem sewn on the bottom and sides sewn together. The only other thing you need to know is the approx waist size and height of the lucky girl in question. 1) I used this chart to get mine. Then I determined how long the skirt should be (12"). I tripled the waist size to get the width of the rectangle (66"). 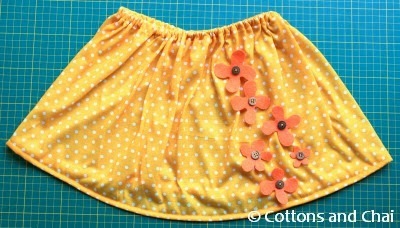 The wider your rectangle, the more gathered the skirt will look. 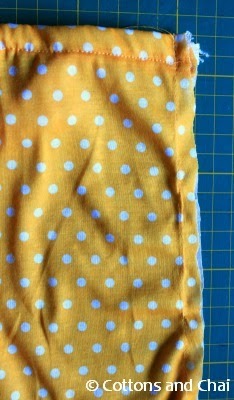 I added 1.5" to the skirt height to account for casing and hem and finally cut out a piece 13.5" * 66" from a bit of yellow polka dotted knit fabric. 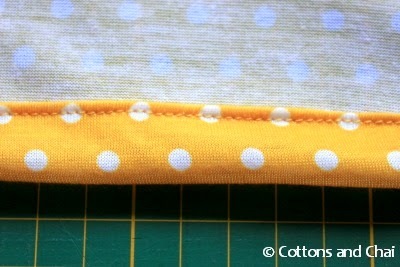 2) Next I folded over twice one long edge and sewed it to create a casing for elastic. 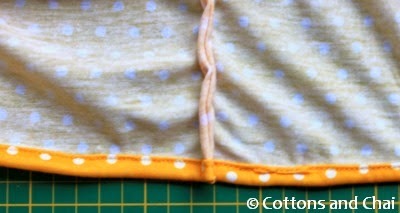 The fold should be wide enough for the elastic to pass through. 3) Time to jazz it up. 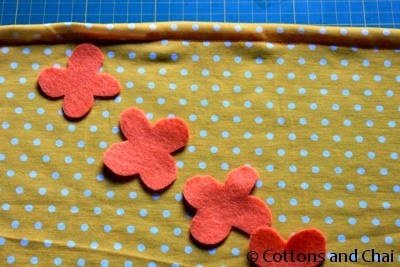 I decided to cut out flowers from orange felt and positioned the smattering of blossoms a little way to the right from the center of the rectangle. 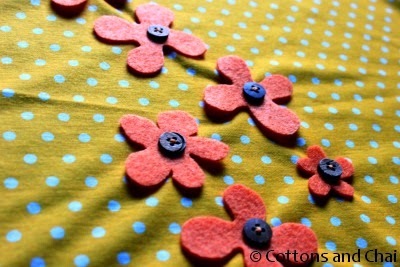 4) Then I hand sewed a button onto the center of each flower. This way the flower is firmly in place, but the petals blow open and free to give that 3-D look. 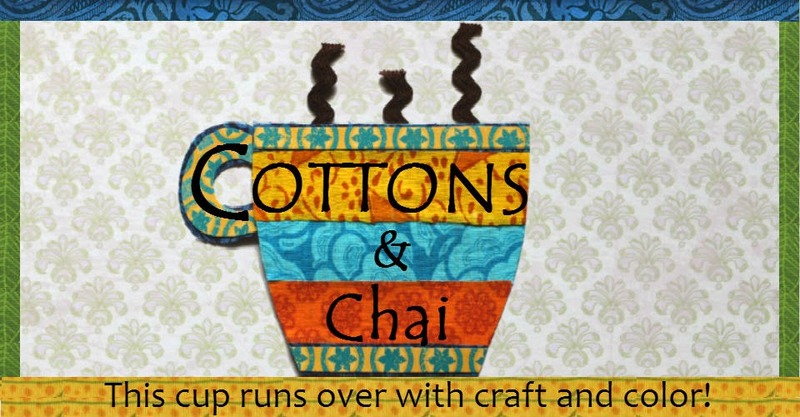 I love these coconut shell buttons I got from my stash in India - they have a dark side and a light side and I used both to add extra detail. 5) Next I cut a piece of elastic a couple inches less than 3/4 the waist size and attached a safety pin to one end of it. Then I threaded it through the casing. 7) Next I cut the seam 1/8" from the edges, turned the skirt inside out and again sewed a 1/4" seam to complete the french seam. Lastly, I folded over the bottom edge twice and sewed around to hem the skirt. 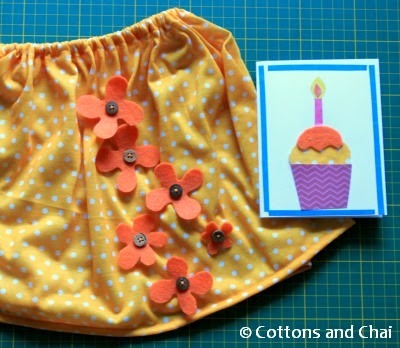 Then I made a quick matching card to go with the skirt - a yellow knit cupcake with orange felt frosting! 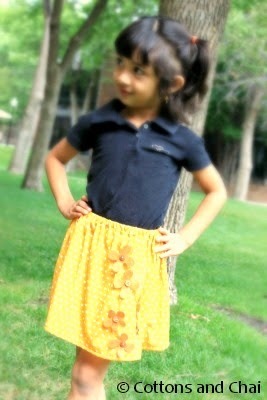 Our feisty 4 and a half yr old little neighbor girl (who's ever-ready to strike a pose) agreed to model the skirt for me! :-) That is a cute cute skirt! The model is such a doll. 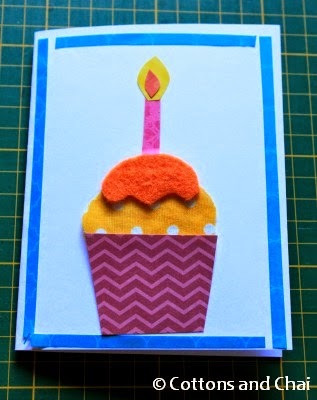 The orange felt frosting on the card adds a really nice touch. Priti - Thanks. Yes, the little model can make anything look fabulous!